Norwalk, CT – May 16, 2007 – The SeniorCare Investor won another prestigious award this month for “Best Blog”. This top award was announced by the American Society of Healthcare Publication Editors (ASHPE) recently. The blog is on the Web at www.seniorcareinvestor.com. “We are delighted to have received such a prestigious award in the highly competitive blog space. And to receive it from our peers in healthcare publications at ASHPE makes us even prouder,” said Eleanor B. Meredith, publisher of The SeniorCare Investor. In addition to winning “Best Blog,” the newsletter won the Silver Award for Best Single Issue for the July 2006 issue, which featured a profile of senior care company Assisted Living Concepts. The profile included an informative financial history of the company, an analysis of what the company would be worth as it transitioned to a publicly traded company, and most importantly, when the best time to invest in the company might be. 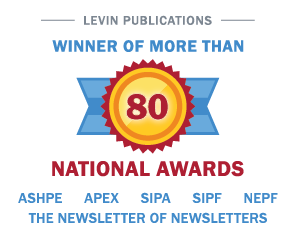 In the past three years, The SeniorCare Investor and its sister publications have won multiple awards from The Specialized Information Publishers Association as well as The Newsletter on Newsletters. Published by Irving Levin Associates, Inc., in Norwalk, CT, The SeniorCare Investor has been covering mergers and acquisitions in skilled nursing, assisted living and independent living for more than 40 years. Contact the company at 203-846-6800 to subscribe or visit online at www.seniorcareinvestor.com.